THE CASE IS IN VERY NICE CONDITION AS WELL AS THE CHASSIS. THE PHOTOS OF THE CHASSIS CLEARLY SHOWS THE TUBES ARE STILL LIGHTING. I HAVE SUPERSIZED THE PICTURES SO YOU CAN SEE EVERYTHING. ALL OLD ELECTRONICS ARE SOLD AS IS. Made in Japan. 11" diagonal screen. 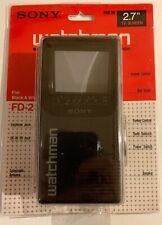 Sony Watchman FD-230 Portable 2.7" Black & White TV NOS Sealed Unopened Retro. Shipped with USPS Priority Mail. A very nice unit with a great display…this portable tube TV has an input on the back for a/v in…so if you have gaming systems with the yellow video out this will work. Lovely vintage portable television by the Korean company Yoko. In working condition and with original box and accesories. This sale is only for the TV, no else will be included.P le as e seephotos fo r mo re d et ai ls f or it’s condition. Ify ou receive th e it em a nd h av e problemsp le as e be understanding an d al lo w us t o correctt he p ro bl em. Vintage 1986 Sony Watchman Walkman era electronics Black & White TV sealed NOS Unopened package. Here is a nice working original 80s Black and White TV. (Der Kunststoff ist im vorderen Bereich leicht vegilbt wie auf Bild 10 zu sehen (der Farbunterschied). und auf Bild 11 und 12 sehen Sie die 2 kleinen Macken. Antenne ist gerade und heile, Ton funktioniert auch :). Made in 1973. 100% OLD CHINA ORIGINAL! Weight about 1 295 gramm (1.295 kg). Very good option for the collection. TV is tested and works great! One of the knobs is missing. You will get exactly what is pictured. I DON'T KNOW WHETHER THIS WORKS OR NOT. SAVE A BUNCH ON MY PARTS. Cleaning out a closet and found this. It works but you need a converter to get digital stations. Radio works. U S Bidders only. Thanks for looking. Ultrasonic?. (does not say it, but I believe it is.). SEE PICTURES. Includes Original box and Instructions also car adapter for use with cigarette lighter. Tiny Amounts of Spot Corrosion. Check Photographs Very Carefully For Condition. (The receiver have installed FM converter 98.5 - 106 MHz for reception of modern stations(VHF). 1)TV range of received frequencies. The AM/FM radio works and sounds great. 2) AM/FM radio. 3) Record player works and sounds great. You would turn a dial to rotate the antenna inside the unit for the best reception. See 1949 ad for more information. The rate will be provided under the. I made no tests, I did not and will not plug it in and see what happens. NO cracks in the plastic. Plastic is mostly shiny and nice! Overall size is 13" x 10.5" x 9". Very nice TV. We would love to make a deal! This is an as-is sale. It is to the size that about 200 of them belong under. Vintage SONY MEGA Watchman TV FM/AM. The FD-500 New!!!!!! Vintage SONY MEGA Watchman TV FM/AM. The FD-500 New!!!!!!. Shipped with USPS Priority Mail. Box has light wear from storage. See pics Sony Watchman is new mint inside. From smoke and pet free home. Thanks for looking please check out my other items. This may be why the top cover plate is missing. Pictures show condition. Condition is indicative of a period unit. Typical blemishes, tiny scratches and do on. Vintage 1983 Emerson Portable TV~FM/AM/PSB/WB Radio~Model VR30 COMPLETE IN BOX Tested and working great! Comes with all documentation, power adapter, car power adapter, ear phone new in packaging, all in original box with styrofoam inserts! See photos for additional details. Sears SR3000 portable tv radio. Excellent working condition. In very good shape for its age. No structural damage that I can observe. Turns on and speaker works great. Normal signs of light use. Antenna looks terrific. Power dial is partially missing but is still fully functional. Sold as is. No returns. Ships fast! Tv needs to have an external tv antenna plugged into it to receive picture. Minor wear from age and use. Could use a good cleaning. No power cord included. Will power on, but may need some work. Please see all pictures for condition and specifics.